Episode 35: "Sweet and Elite"
Intro: While visiting Canterlot to get fabrics for her shop, Rarity is overwhelmed by the room she's given thanks to Princess Celestia's hospitality. Act 1: As Rarity sets out to design a dress for Twilight Sparkle's birthday, Canterlot ponies snub her for her small-town roots. She determines to prove her worth by making Twilight's dress specially fancy. While buying expensive material for the dress, she literally bumps into the famous Fancy Pants. He invites her to a Wonderbolts Derby, and other ponies begin pressuring her to attend their events as well. 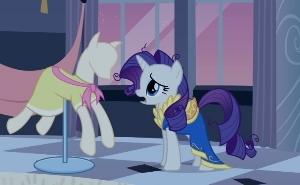 Act 2: The song "Becoming Popular" shows Rarity joining Canterlot society, but this leaves her no time to finish Twlight's dress. An invitation to the Canterlot Garden Party prompts her to send an apology letter to skip Twilight's birthday party altogether. As Rarity leaves for the garden party, Twilight and the others show up at her door. Act 3: Twilight explains that she's moved her birthday party to Canterlot because of the letter, and Rarity tries to attend both parties at once. She's caught, and the Mane Six decide to crash the garden party with predictable results. Yet Fancy Pants accepts Rarity's friends and she learns to accept the home and friends who have made her who she is. Character: Equestria departs from the pattern of being a "Sugar Bowl" kingdom by the preponderance of snobs and jerks we encounter as incidental characters. It's refreshing to see Fancy Pants brought in as a genuine good guy. He's patient and understanding and sticks by Rarity, yet he won't abandon Twilight mid-conversation at Rarity's bidding because he's accepting of both of them (thus demonstrating more loyalty than Rarity herself at that moment). 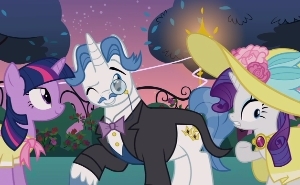 His wink in that scene suggests he's been on to Rarity's pretentions from the beginning but is willing to overlook her faults, in contrast to other Canterlot ponies who are ready to turn on her in a moment. I found it interesting that Fancy Pants doesn't actually wear pants himself. Come to think of it, you'd be hard-pressed (get it?) to find characters in pants on this show. [One Bad Apple puts Goldengrape in lederhosen.] The ponies here and at the fashion show in Green Isn't Your Color show the herd mentality of the upper class, but it really isn't any more objectionable than the group reactions common to Ponyville. Hayseed strikes just the right balance as a genuinely nice and friendly pony who's grossly embarrassing to be seen with in high society, and his presence foreshadows Rarity's friends' visit, which otherwise comes out of nowhere. In the premiere Rarity says she has always dreamed of living in Canterlot, and her personality throughout the show seems to be an even mix of the best and worst of Canterlot's populace. Fancy Pants and Princess Celestia remind us of the generosity and kindness of Rarity's better moments, while Jet Set and Upper Crust bring out her superficiality and occasional superiority complex. But as in her other episodes (Suited for Success, Green Isn't Your Color, Sisterhooves Social), she actively struggles with her priorities and has to rationalize her bad decisions. Her anguish bursts out as soon as her ruse falls apart, and despite her melodramatic habits I found her arc in this episode genuinely moving. Opal is well used here in a Spike-like role as the voice of reason, and without having to use words. Speaking of Spike, in my mind he and Twilight had a fantastic birthday celebration with just the two of them before she left with the others for Canterlot. To just leave him out altogether would be unthinkable. It's not absolutely necessary to Twilight's personality that she prefer so simple a dress, but the idea feels very appropriate. The rest of the Mane Six behave just as we'd expect, given what we saw at the gala. I even buy Applejack's misinterpretation of "garden party" since Apple family socializing usually revolves around work. I liked seeing Fluttershy on good terms with the animals that rejected her at the gala. 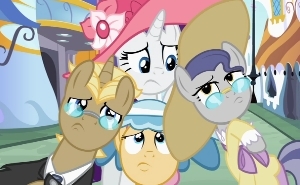 You know, it wouldn't surprise me at all if Celestia granted the Mane Six the room right outside the garden party in hopes of a "repeat performance" to shake up the upper class. Lesson: The story recalls Griffon the Brush Off, once again forcing one of the Mane Six to choose between old friends and new ones. (Incidentally, that episode was one that exposed early on the fact that Rarity has Ponyville tastes behind her high-brow facade.) Rarity stumbles in the middle of this story as she tries to dissociate herself from Ponyville. There's a lot we could analyze in her Rainbow Dash comment, but it's Ponyville and not RD that she's embarrassed about. And yes, she could have described RD as winner of the Young Flyers' Competition, but that incident was also a public humiliation for her that she wouldn't want the others to be mindful of. Anyway, her loyalty at the end and her constant good intentions are heartwarming. Once again the writers have given us a fun way to see the good and the bad of the moral played out. I do think she's let off a little too easily once exposed, though, as Twilight assumes Rarity's issues are purely business-related and seems satisfied with that. I suspect Twilight knows better and is being gracious; Rainbow Dash immediately detects the disloyalty and isn't as willing to let it go. (And it's Rainbow who suggests they crash the garden party. Hmm...) But to young viewers it may seem that Rarity's getting away with the same thing Apple Bloom got in so much trouble for in The Cutie Pox. It's not as serious a flaw as in The Mysterious Mare Do Well since Rarity is so vocally penitent, but it prevents the episode from reaching the high levels of Rarity's best episodes. Logic: Despite many colts and fillies and occasional elderly ponies, we've seen very few characters at an adolescent stage of growth. The bellhop seems to be the clearest example we've seen so far. Also, as a unicorn he should be able to levitate that luggage. I think he's just playing for sympathy so he can get a bigger tip. Connections: As of this writing (post-season 3), this is the last solely Rarity-centered episode, and it's the culmination of all her others, as well as a follow-up to The Best Night Ever. Also, as Twilight mentions the upcoming Grand Galloping Gala, we see behind her the cracks in the pillars from the previous one featured in that episode. Resonance: The hospitality of Princess Celestia and the support of Fancy Pants are heartwarming, as is Rarity's ultimate choice to stand up for her Ponyville friends. (Nice fake out on that, by the way.) As awesome as "Becoming Popular" is, I tear up at the end, seeing Rarity saddened by her neglect of Twilight's dress and apparently falling asleep from exhaustion as she starts work on it. She realizes the cost of her popularity before the last notes of the song that celebrates it. There are lots of gags in the last half of the episode, many of them too quick or too subtle to catch on first viewing. Most prominent and funny are the abuse Opal suffers, the party cannon, "What croquet mallet?" and Twilight's dancing. Other Impressions and Final Assessment: A comparison with Griffon the Brush Off's execution of a similar premise demonstrates the series' growth, specifically with regard to the sharpness of the writing and the overall heightened experience of watching a second-season episode. I appreciate the animators dressing up the usual Ponvyille background ponies so as to be almost unrecognizable and a good fit with the Canterlot residents. The song in the second act almost deserves a review in itself since it contains so much both visually and lyrically, and represents Rarity so well. The vocals showcase the beauty and solidity of Kazumi Evans' singing voice. I would consider this the episode that best captures Rarity's character. It's interesting, moving, and fun all the way through, though I would have liked to see Rarity face a little more direct comeuppance for her slip here. That and a neglect of Spike drop this below A Dog and Pony Show and Green Isn't Your Color. But overall, it's another excellent episode.